Long chain polyamides (PA) PA 6.10 and PA 6.12, traditionally used to produce monofilaments, are now employed in countless applications requiring a high chemical resistance and a good dimensional stability. Polyamide 6.10 is obtained from the polycondensation of hexamethylenediamine and sebacic acid. The latter is extracted from the seeds of the castor oil plant and accounts for more than 60% by weight of the PA 6.10. As a result, PA 6.10 can be defined as a product partially coming from a renewable resource (figure 1). Polyamide 6.12, instead, is the result of the polycondensation of hexamethylenediamine and dodecandioic acid. In this case, the polymer is obtained from 100% fossil raw materials. 1 Lower water absorption compared to PA 6, PA 66, polyphthalamide (PPA) and PA 46 and, as a result, higher dimensional stability and a limited variation of properties in case of changes in ambient humidity. On the other hand, water absorption is slightly higher compared to other long chain polyamides, such as PA 11 and PA 12. 2 High chemical resistance in contact with calcium chloride and zinc chloride solutions. Though suitable for many applications, PA 6.10 shows lower performance levels compared to PA 6.12, which passes the tests required by law for several kinds of ducts, also in the presence of connections generating strong stress in the material resulting in stress cracking. In short, it can be said that PA 6.12 can easily replace PA 12 in many applications, including single-layer and multi-layer fuel ducts. 3 Excellent resistance to peroxides. 4 Higher thermal resistance compared to PA 11 and PA 12. Considering the general increase in temperatures in the different segments of a car (air circuit, cooling circuit, fuel supply line, etc. ), the availability of heat-stabilised PA 6.10 and PA 6.12 represents a very interesting opportunity, given the limited thermal resistance of both PA 12 and PA 11. 5 Excellent resistance in contact with motor cooling fluids, largely exceeding the performance ensured by PA 66. 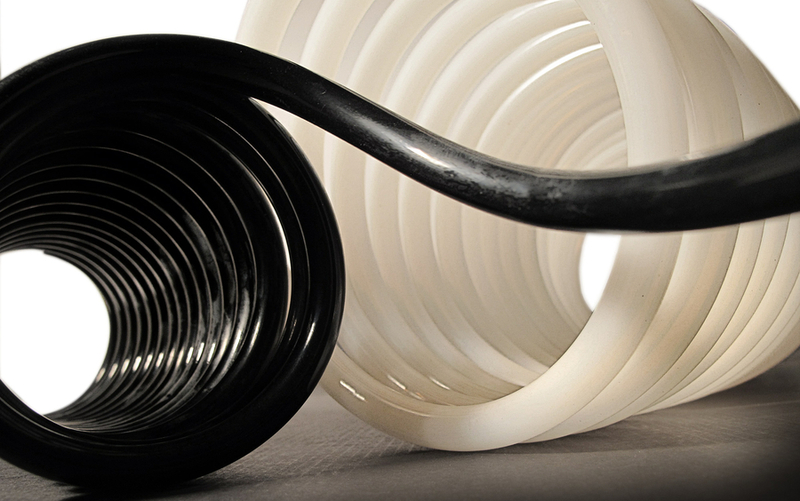 These polyamides can replace the reinforced-rubber hoses used for the cars’ cooling and heating systems. In some cases, they represent a valid alternative to products like PPA. 6 Lower permeability to fuels compared to PA 12. 7 Higher resistance to hydrolysis in contact with hot water; this property, together with good dimensional stability, makes these polyamides suitable for the manufacturing of components which can replace brass in plumbing and heating systems. 8 High resistance to gear lubrication oil. Considering a possible increase in temperatures, PA 6.10 and PA 6.12 can be used as viable alternatives to PA 12 and metal in the production, for example, of clutch fluid ducts. 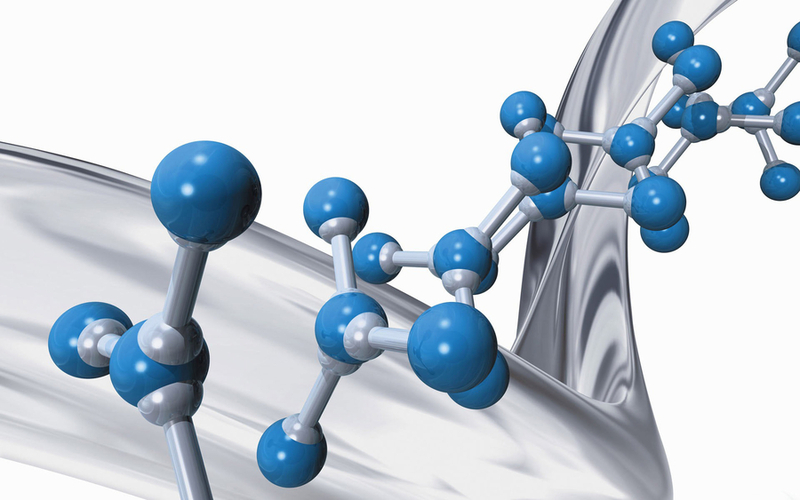 Polyamides 6.10 and 6.12 are semi-crystalline materials, suitable for many hi-tech applications. 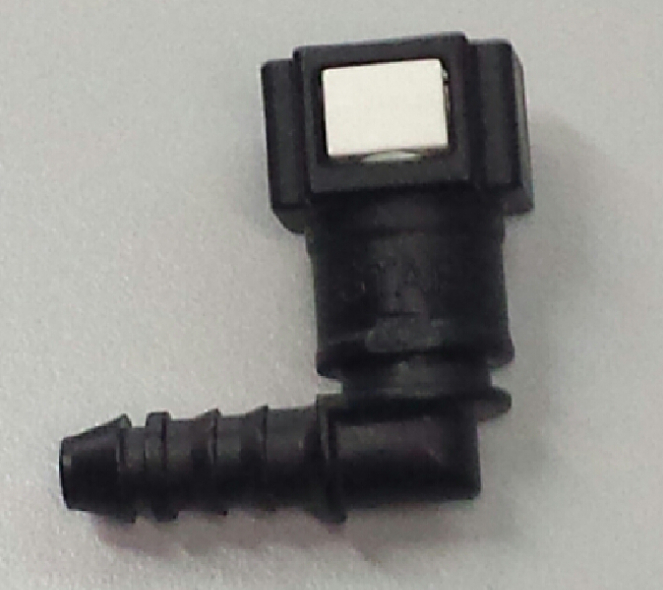 As for other polyamide-based materials, injection moulding grades as well as extrusion grades are available. In addition, fillers, stabilisers and additives can be easily added to them in order to obtain special features. These polymers can be processed without difficulty and can be considered “easy to mould” and “easy to extrude”, in particular when compared to special materials such as PPA and PA 46. 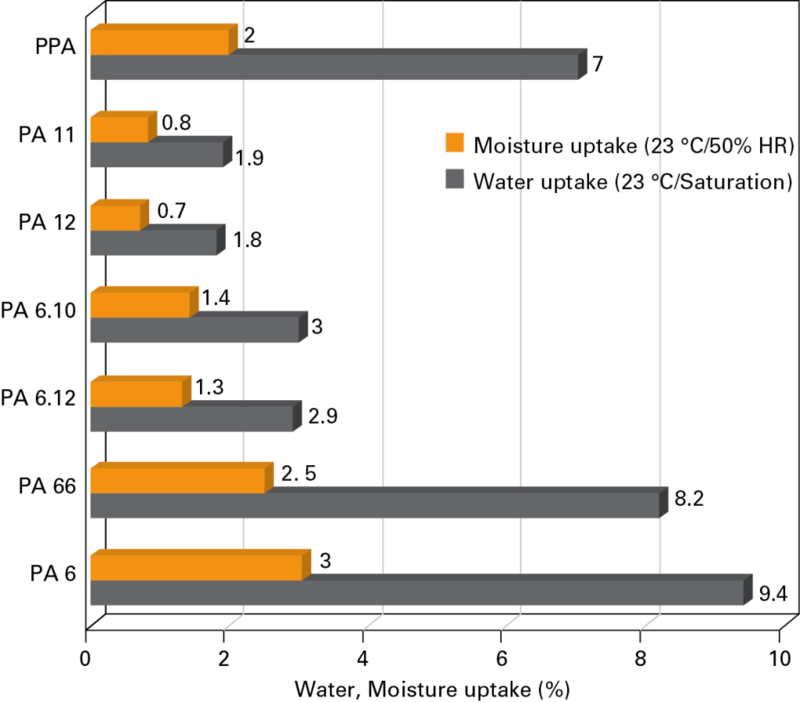 Figure 2 shows a comparison of the water absorption values measured on specimens conditioned at 23 °C and 50% relative humidity and on saturated samples. It is possible to observe that PA 6.10 and PA 6.12, when saturated, absorb about one third of the water compared to PA 6 and PA 66, and less than half of the water compared to PPA. This means that these polymers represent a valid alternative in those applications requiring a good dimensional stability under varying ambient humidity conditions. This characteristic is particularly appreciated in the production of components which must comply with strict dimensional tolerances. 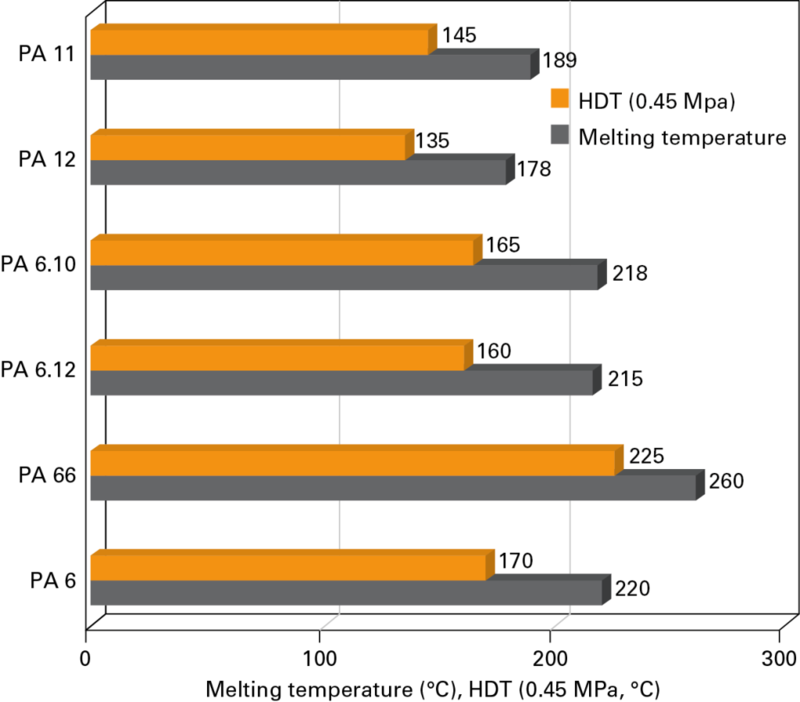 Figure 3 illustrates a comparison between melting temperatures and heat deflection temperatures (HDT). 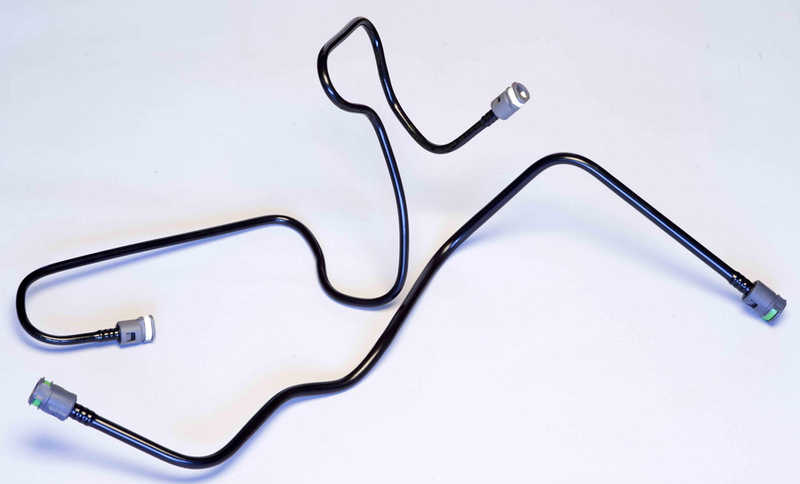 Long chain polymers, such as PA 11 and PA 12, have some limitations of use, deriving from the increase of temperature in several components including fuel ducts, clutch fluid ducts and motor cooling ducts. These limitations are even more evident when the components are subjected to high stresses. PA 6.10 and 6.12, thanks to higher melting temperature (+40 °C) and HDT (+20 to + 25 °C) values, when adequately stabilised in order to improve their long-term resistance to thermal stresses, can actually represent an excellent cost-effective technical alternative. Moreover, they can also validly replace PPA at relatively high operating temperatures, such as in applications for the production of specific parts of plumbing and heating systems as well as of cars’ cooling circuits up to 135 °C. Figure 4 shows the development of the tensile strength after the immersion of the polymers in 50:50 water-glycol solutions. 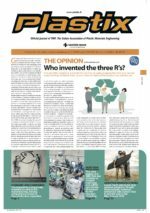 The tests performed confirm the excellent behaviour of 30% glass-fibre reinforced PA 6.10 (Radilon® D RV300RG by RadiciGroup Plastics) compared to standard 30% glass-fibre reinforced PA 66 and hydrolysis-stabilised 30% glass-fibre reinforced PA 66. Thanks to this crucial property, PA 6.10 is now available for automotive applications where PA 66 does not comply with the technical specifications. Moreover, it could represent a valid alternative to PPA, offering additional advantages such as a better processability and a reduced water absorption. Figure 5 shows the comparison of the results obtained through a water immersion test relating to PA 6.10 reinforced with 50% glass fibres (Radilon D RV500RKC 106 Nat) and PPA reinforced with 40% glass fibres. 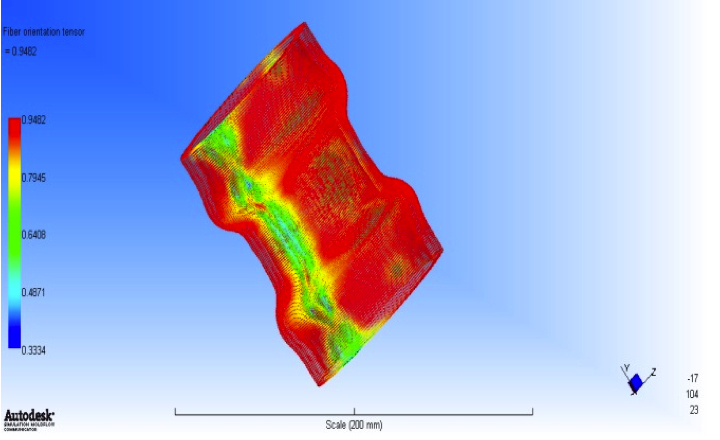 PA610 shows a lower decay of the tensile strength. 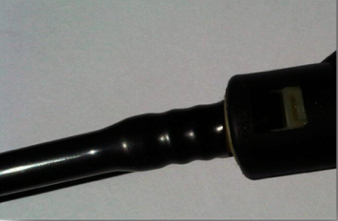 This category of PA 6.10, designed to improve glycolysis resistance and featuring a glass fibre content varying from 30 to 60%, is now increasingly used in the plumbing and heating industry, coffee machines and those applications in which hydrolysis resistance and dimensional stability are key factors. Versions approved for the contact with drinking water according to the KTW and ACS standards are already available. Figure 6 illustrates the simplified model of a fitting for a plumbing and heating system. In addition to an excellent hydrolysis resistance, this component requires high mechanical properties, such as tensile strength at break and creep strength. Nowadays PA 6.10 is used in the production of ducts for industrial pneumatic applications as well as the transportation of compressed air. Figure 7 shows the stress values calculated according to DIN 73378 (focusing on the burst pressure of the ducts) for different materials. The references (dotted lines) designate the flexible (PHL) and semi-flexible (PHLY) PA 12. 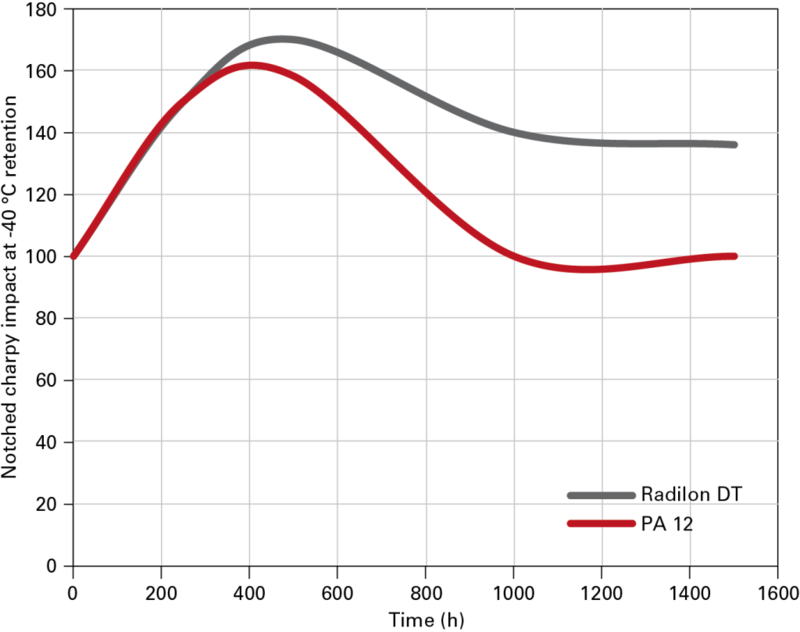 The same diagram shows the behaviour of three formulations based on PA 6.10, which easily exceed the values ​​reached by PA 12, especially at elevated temperatures. Figure 8 displays spiral ducts made of Radilon D40P50UK. This material offers good transparency, UV resistance, easy processing and affinity for a wide range of pigments in different colours. The air ducts of the truck braking system have to meet very stringent requirements set forth in various regulations. The main characteristics required are: high burst pressure resistance, impact strength even at low temperatures, stress cracking resistance when exposed to zinc chloride solutions, as well as good flexibility to facilitate assembly operations. The extruded ducts made of Radilon D 40EP25ZW (figure 9) passed all tests in conformity with DIN 74324, DIN 73378, ISO 7628, SAE J844 and FMVSS 106. 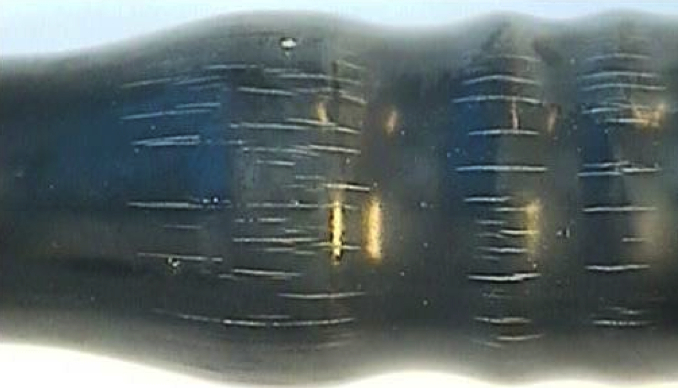 Fuel (diesel and gasoline) ducts are required to pass an immersion test in a zinc chloride solution, including the contact surface between the duct and the fitting, where the stress concentration induced by assembly operations is particularly high. Figure 10 shows how, after 200 hours of immersion in a 50/50 water/zinc chloride solution, no stress cracks have been recorded on samples of PA 6.12 and some special types of PA 6.10. Conversely, when subjected to the same test, a material which is not resistant to stress cracking displays cracks similar to those reported in figure 11. PA 6.12 passes this test even in case of materials with a higher modulus, such as Radilon DT 40EP75W (figure 12), a rigid material suitable for extrusion. Figures 13 and 14 show the behaviour of a PA 6.12 rigid extrusion grade (Radilon DT 40EP75W), immersed in the DOT 4 gear oil at 100 °C for 1,500 hours. The capacity to retain its properties was higher than the PA 12 used in the same application. Already today, in several cases, the fittings for fuel ducts (figure 15) are made ​​from a PA 6.10 grade suitable for injection moulding applications. The typical formulation includes materials reinforced with 30% glass fibres. A 30% glass-fibre reinforced PA 6.10 grade is able to replace PA 12 with the same type and amount of filler thanks to its excellent thermal and dimensional stability. 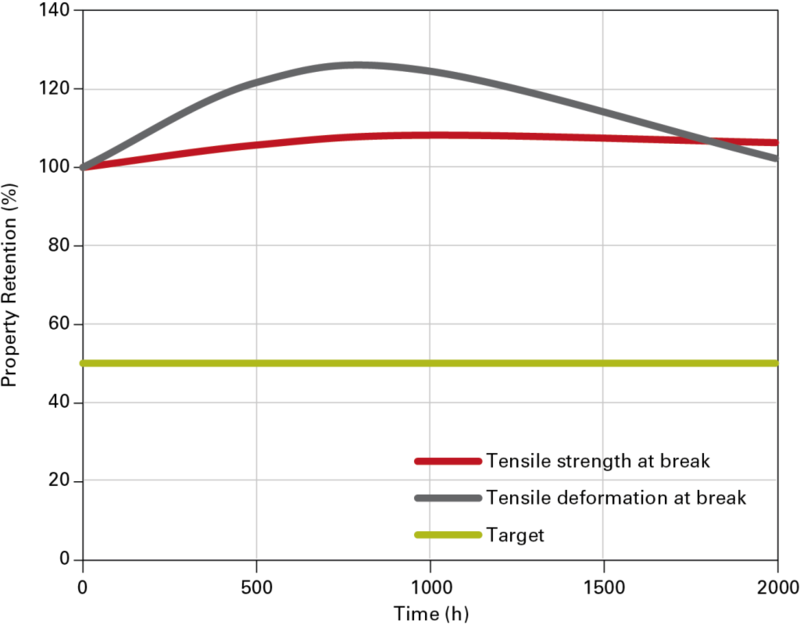 Figure 16 shows the trend of the tensile strength and deformation at break for a heat-stabilised PA 6.10 reinforced with 30% glass fibres (Radilon D RV300W); as can be seen, there were no significant changes in the properties after the thermal ageing in air for 2,000 hours at 130 °C. In recent years, metals and other long chain polyamides have been gradually replaced with polymers based on PA 6.10 and PA 6.12. This has been possible thanks to some peculiar characteristics of these materials, which are particularly interesting as a result of their excellent chemical resistance, dimensional stability and easy processing. 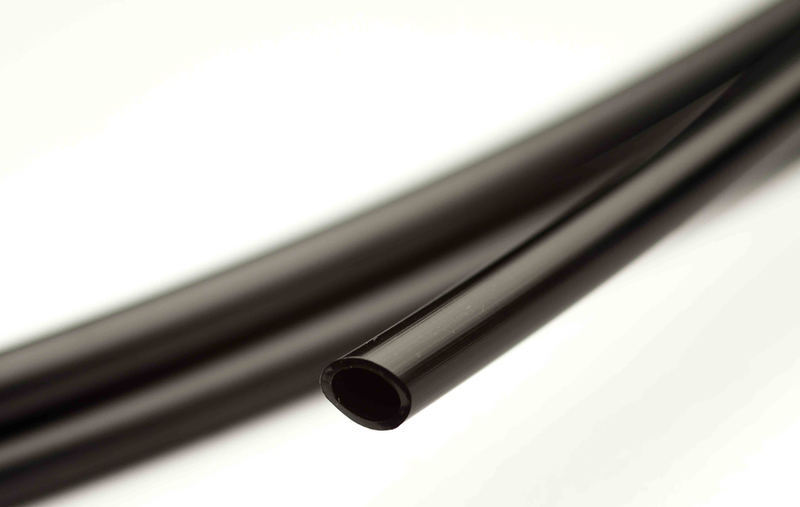 In comparison with other long-chain polymers, such as PA 12 and PA 11, they offer considerable advantages thanks to greater heat stability, moreover they better address the new performance requirements related to higher service temperatures. Features like an excellent resistance to hydrolysis may, in a short time, pave the way for new solutions in the plumbing and heating sector as well as in the automotive industry with the replacement of metals and other special polymers more difficult to process. 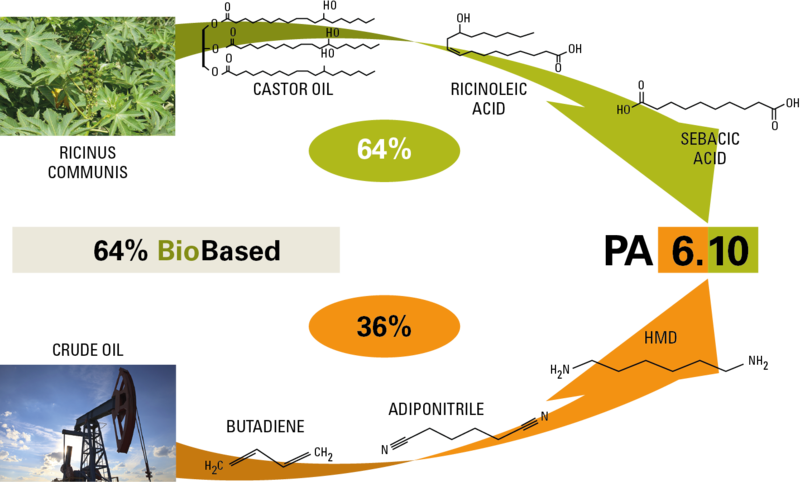 The use of partially bio-based PA 6.10 also leads to the development of products with an increasingly lower environmental impact, which plays an important and decisive role in the choice of the materials of the future.